Heather and the entire staff from LVL Events are amazing to work with! Elevated Pulse has had the pleasure of working closely with them over the last few years and would recommend them to all Brides & Grooms looking for a wedding planner or design team. We consider them experts in the wedding industry which is why we've asked them to put together this very informative blog post for you! Enjoy! Here at LVL, we think both bands and DJs can be a fantastic part to your big day! However, we often find our couples that are deciding on either a band or a DJ forget to compare the details to help them decide which one is a better fit for their wedding day. As you can see in the chart above, there are many things to consider about your day, your budget, your venue, your vision, etc. We hope to elaborate on each of these for you so that you are making the best decision for YOUR wedding. Cost– Most couples are on a budget, and whether it is big or small, there is an overall cost you are trying not to exceed. Most wedding bands range from $4,500+ to $15,000+ and a DJ’s pricing can start from $1,400+ & up. Why are the costs of bands compared to DJs so high? Simply put, there more people to pay. Bands usually have around 5-14 members and are typically paid on an hourly rate. Depending on the time scale of your wedding, you may need to book a band or DJ for additional hours. These additional hours are extended time to play beyond the 4-5 hrs. A DJ’s hourly rate is often $200 or so and a band’s is often $500+. Once again, a band’s higher hourly rate is due to the greater number of people in it. Space & Power – For most couples planning their wedding, it may be their first time planning an event to this scale. Two important things to remember are space and power. These are often the most overlooked details that are very important to your DJ or band. Think about your venue – is it spacious? Are you filling it completely with your guests? Is there enough space for a band? A band usually requires a space of 16 feet x 8 feet or larger to set up all equipment, speakers, and microphones. In addition to the space, they often require a stage of that same size, especially when the event is outside, to ensure they are on level, dry ground. With a DJ, spacing is more flexible. DJs often only require a 6 ft table or 6 ft of space to set up all their equipment. It is also important to keep in mind the spacing needed between your band or DJ and your guests. Music is played loud, so also take into consideration the space needed to put your guests at a comfortable distance. In addition to space, power is equally as important. Without power you have no amplification! Bands often need 40+ amps of power and DJs usually a single 20 amp circuit. Many beautiful wedding venues are older or historic, and have limited power sources or sensitive circuits. It would be terrible for the band or DJ to begin to play and have a circuit blow due to insufficient power. To avoid this, talk to your venue manager, they can usually answer the questions of how much power is available and where the power is located. Set up & Break Down – It is important to think about set up and break down times as well. You may have your venue for a set amount of hours, which is usually the case, so if you are hoping to maximize the minutes of your wedding, you should consider the amount of time your band or DJ will need to set up before your wedding and to break down after. Some venues have multiple weddings in a day, which might make it difficult for your band to get in and set up on time. A band often needs 1-2 hours to set up, whereas a DJ often takes about 45 mins. Sound Check – This is done after your DJ or band is set up and they want to make sure everything is in order to begin playing. Typically, they will do a music level check as well as a microphone check. Depending on the location and timing of your band or DJ, this can be a bit of a distraction if it is close to where it can be heard by guests. Bands often need 30 min - 1 hour or longer to do a sound check and to make sure the musicians, equipment, speakers, and microphones are all perfect. A DJ usually can do a sound check in about 10 minutes. MC (Master of Ceremonies) – Your MC is the person on the microphone that announces all the formalities to your guests. They typically introduce themselves (and the band) as well as announce grand entrance, first dance, toasts, dinner service, formal dances, cake cutting, bouquet and garter toss, etc. The MC should be eloquent, experienced in wedding MC’ing and confident on the mic. The MC should be the lead contact for your coordinator to go to in order to cue each event. A great wedding DJ can also be an MC. Most wedding bands have an experienced MC as well. However, for many genre-specific bands, a capable wedding MC is not always available, so be prepared to hire someone or asking someone else that can be the MC for your wedding and do an excellent job at it. Hidden Details – There are many overlooked or forgotten details that often come up during planning or on the wedding day : Lighting, breaks / pauses, vendor meals, and flexibility of playlist. Lighting is sometimes a necessity. If you are having your wedding in a location that will be dark for part or all of your reception, it is very important that the DJ or band had enough lighting to do their job, as well as be seen by your guests. Bands are there to entertain your guests, so it is great to light up the band for added color to their performance. Breaks /Pauses - Just like at a concert, your band will have natural brief pauses between songs. This is normal as you are having a live, human performance. Bands are often fun and upbeat with high energy, so most need to take 15-20 min breaks after every 45-60 min set. During this break, most bands play music on an iPod for the festivities to continue. An inexperienced wedding band might not be as prepared, so definitely make it a question to go over with your band. A DJ typically plays straight from beginning to end. Even if they take a short dinner break, they can leave the music playing for a few songs without needing to be there. A DJ is often selected based on their ability to mix, flowing songs seamlessly together during dancing for continuous high energy. Vendor Meals – You should provide a vendor meal for all of your vendors working throughout your reception. 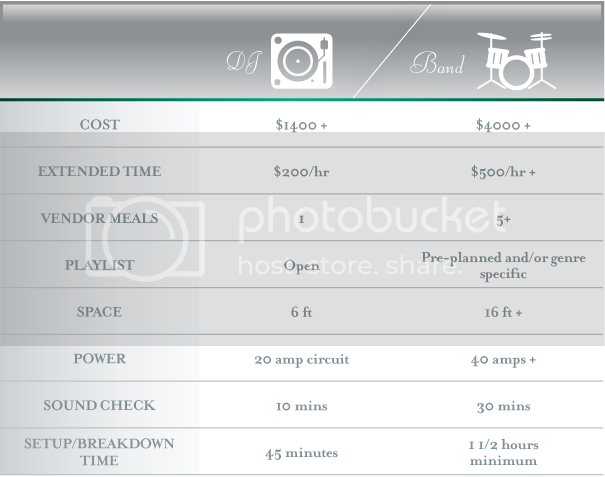 Most often these include your coordinator, photographers, videographers, and DJ or band. These meals are usually at a reduced rate from your guest’s price. For a DJ, you usually have one or two meals. For a band, you have usually need to provide around 5-14 meals. Most vendors, including bands and DJs, have in their contracts to require a hot meal and sometimes even at a specific time. Your coordinator should be mindful of the band’s breaks and when their vendor meals will be ready. Play List- Many times, a band is hired because they are phenomenal at one specific genre of music. If so, you might be limited to that genre the entire night. (This could be ideal for you or a possible concern). Many professional wedding bands are dynamic and can play a variety of genres, however, may not necessarily be able to field requests by your guests or you on that night. A great DJ has an extensive library of songs that they can tailor to your requests and most importantly, your crowd’s. A great DJ will also adjust the music to keep the crowd dancing. A wedding band may be able to do this as well, so it is a good question to discuss with potential bands. LVL Events focuses on the design, details and flawless execution that will make one of the most memorable days of your life an extraordinary celebration from beginning to end. They ensure it’s your vision, your style and your personality that all comes to life in a sophisticated and elegant way that fits your dreams and your budget perfectly. Give them a call today to schedule your personal consultation!